You are not logged in. 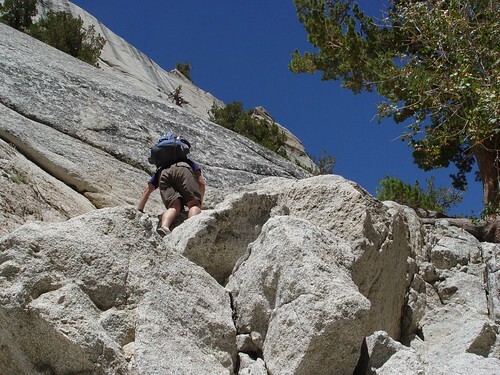 [Log In] Mt Whitney Zone » Forums » » Reference » Ebersbacher Ledges- Origin of Name? #25443 - 06/07/07 01:05 PM Ebersbacher Ledges- Origin of Name? How did the Ebersbacher Ledges get their name? Thanks. I think they were named after a backcountry ranger who died mysteriously but was otherwise undistinguished. Paul, thanks for posting! Very interesting. Paul Ebersbacher, Thanks. Truly amazing. Do you think you might be able to coax some more details out of your aunt and uncle about how the ledges got their name and when? P.S. Bob R and hightinerary, Thanks for your responses. I didn't realize the answer was so tough to get when I asked it. Someone else emailed re talking to them too. I will try to get in touch with them next week and see if they wouldn't mind chiming in with some more detail. I think they still travel a lot so it may take a little time to catch up with them. Paul, many thanks. This is a little piece of history that undoubtedly would be lost, if not recognized at this point and documented. It would not surprise me if this showed up in a book at some point. Thanks so much Paul. After years of speculating and guessing about the origin of that name Mr. Ebersbacher turns up on this board and clarifies it once and for all. How cool is that! Paul, thank you so very much for your posting. I thought over the years that the Ebersbacher Ledges were named from antiquity by long-gone climbers. But your post showed we have living legends out and about, alive and well! Since you mentioned Florida as their home, I decided to search the Web to see what I could find for the Dale and Frances Ebersbacher names. There are many sites crediting the Ebersbachers with the first climb of Mount Nelson in British Columbia back in 1951. As I did more exploring, I ran across a Dale Ebersbacher making various editorial postings. I searched the Web for a phone number and managed to find one. It is simply amazing what is on the Web! Well, having a phone number, I decided to try it. I had every thing to gain and nothing to lose. If it was out of service, I would just search again. If the number reached somebody, particularly an Ebersbacher, he or she would most likely be related to Dale and Frances, and steer me accordingly. After all, how many Ebersbachers have any of us ever met? The answer for me is none, but I sure have their name emblazoned in my deepest consciousness from all the times I've scrambled over the Ebersbacher Ledges, lugging heavy backpacks up and down the North Fork on the Mountaineer's Route. On my first time up the Ebersbacher Ledges, I managed to go the wrong way and had hikers across the canyon screaming in shear terror that I was going to die. 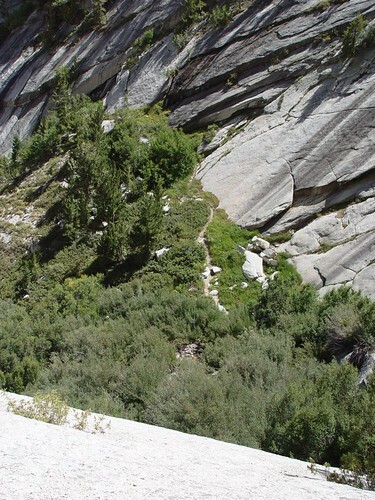 Thankfully, however, I am an experienced rock climber and have enough fear to keep safe and be careful enough to avoid taking the plunge off the ledges as others have so unfortunately done. Over the years on various climbs in other mountain ranges, I have taken some falls, but always safely roped and belayed. Be that as it may, I decided to make the phone call. A lady answered. I immediately identified myself and asked her if her name was Frances, and if she was a mountain climber. I was so excited to hear her say yes! Then I asked, to make sure I was talking to the right person, if her husband's name was Dale, and again she answered yes. Eureka! Would you believe we talked for nearly two hours! Dale and Frances were fun to talk to, and both of them love talking about mountaineering. To me, it was an honor talking to living legends, especially when their name has been a part of my Whitney experiences over the past 35 years. It turns out that Dale and Frances set out to climb Mount Whitney's East Face in July 1953. I asked them if they remembered the date, but all they could remember was that it was a "three-day weekend." Since the Fourth of July in 1953 fell on a Saturday, I believe that was most likely the weekend they did the climb. 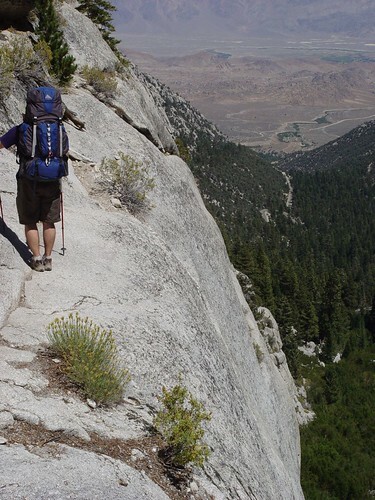 They took the Mount Whitney trail to the North Fork of Lone Pine Creek, as we do today. Back then, however, the only route up the North Fork was a bushwhack through the thick growth of willows. As they moved up the canyon, they spotted the ledges. And being the accomplished mountain climbers that they are, they decided to try the ledges to see if they could bypass the seemingly impenetrable wall of willows ahead of them. Dale and Frances, as far as they knew, or anyone else at the time, were the first ones to discover the ledges, and the first to climb them. So, there we have it. Dale and Frances were the first to climb the ledges, which have been associated with the Ebersbacher name ever since. Thanks, Paul, for apprising us about your aunt and uncle. Until you posted, I had no idea how the ledges got their name, or that the Ebersbacher name was from a living person. In this case, two live wires! Dale and Frances are a wonderful couple who always did their mountaineering together. To date, they have been happily married for 60 years and have enjoyed mountaineering to the full, but are now quite content to be retired flatlanders in Florida. Dale Ebersbacher keeps up his exercise as an avid tennis player, as Frances watches his games whenever she can, and mountaineering will always be a lifetime of precious memories. I considered it a great honor to talk to two living legends who share a passion for the mountains. And after talking to Dale and Frances, I cannot think of a better name for those ledges—Ebersbacher Ledges. At the risk of overextending our welcome on your Message Board, let me introduce myself. I'm Diana Ebersbacher (oh no, not ANOTHER one). My cousin, Paul, called me tonight to tell me of his messages to your Board, and I called my parents, Dale and Frances, to try and hook them up to someone with answers to your questions. My Dad just laughed and said he probably knew why I was calling, since he'd already talked to Wayne and Bob R.
So, thanks to you all for the Ebersbacher welcome (even though I'm just here on their coat tails). Oh dear, now I'm answering my own post. I just wanted to add something: I am amazed at how all of you have spelled Ebersbacher correctly. That never happens anywhere. It's a source of amazement! Diana, Thanks a bunch for posting. Another fine surprise! I couldn't have made a wild guess that I would be reading messages from members of the Ebersbacher family when I first asked the question. In fact, after the first few responses here I was surprised that no one was sure of where the name came from. I felt the case was closing with no sure answer ..... then Paul posted his message, a bigger and pleasanter surprise. Wayne, Thanks for the sleuthing and fine report. And Bob R. too for his email efforts backstage coordinating and motivating and letting me know what you guys were up to, Tony B for first asking the question a year ago and Mono for answering back then and bringing up the possibility that it might be named for Dale and Frances, and thanks everyone else who posted messages on this subject for their interest in Mt. Whitney history. ...and thank goodness for the adventurous spirit of Dale and Frances Ebersbacher that led them to what has become known as the Ebersbacher Ledges. Welcome to the board, Diana. We sure know how to spell Ebersbacher, but I'm not so sure if we all know how to pronounce it correctly, though. Ebersbacher looks frightening, but when you break it down, it's just as it looks: "Ebers" is how you would think, and the "bacher" is pronounced like the popcorn guy, Orville Redenbacher. As a matter of fact, Paul's brother, Mark, suffered through being called Orville while he was in school. As you can imagine, we've had all sorts of spellings of our last name. The latest for me was (I'm not lying about this) "Ketchenbalmer." Now you can not only spell it but pronounce it! This is so fun to read! Some history - recaptured and clarified! Great post guys and great information! Thanks! I live in Big Pine - just relocated here in November - and hope wonderful little suprises like this keep happening - that what makes this board so useful and great. It has always saddened me the way much of Inyo County's past has not been properly documented and/or preserved for future generations (the ransacking and dismantling of Norman Clyde's cabin in Big Pine by some locals and DWP comes to mind....that was an outrage). Some people raised here seem to take for granted what they've been blessed with. In the short time I've lived here, I've noticed visitors to this area sometimes seem to cherish it more than the locals do....go figure....this is not a blanket statment of course, many locals DO love and protect this area's history. Again thanks for this thread! Speaking of history. I'd be interested in reading any stories about the Ebersbacher Ledges, if anyone has any. My girlfriend and I went out to climb Whitney via the Mountaineers Route a few years ago. We had never been to the Whitney area but we had a great time. On our first day we headed up and found the Ebersbacher Ledges by referencing photographs we found on this web-site (thanks Bob and SnowNymph!). As we started up the first portion of the Ledges I came up quite easily..but Marisa sort of came up above the pine tree. Well, she got a couple of feet above the tree and got on some of those small, rocky pebbles that litter the Ledges and she felt like she was sliding backwards toward the edge. She started panicking and I reached down and grabbed her pack and hauled her the rest of the way up. Thanks so much for the story, and especially the photos. My parents really enjoyed looking at them, they brought back great memories for them. Wow, I pop in as I'm going to be up the MR again in August and what do I find but posts from Ebersbacher's! Paul and Diana please pass along my thanks to Dale and Frances for discovering a way through no matter how precarious it feels at times. Thanks so much to all for adding to a story I've always wondered about. Though it was simpler to do than explain, it was a highlight to the hike through the North Fork drainage, and offered some great views and pics. (below)One of our first views of the E-Ledges from below, here we get a glimpse.. the top most line of trees marks the area. 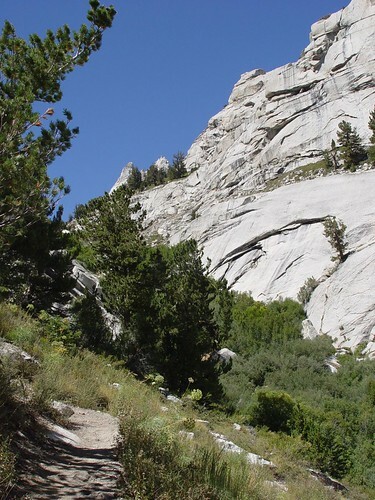 Looking up towards the scramble to the big pine, with packs. From the ledges, looking back down at the trail, a shear drop. Thanks so much for your messages and the beautiful photos. My parents are really enjoying reading all of these, and seeing the photos. It brings back lots of good memories for them. And the rest of the Ebersbachers appreciate it, too! Generated in 0.026 seconds in which 0.018 seconds were spent on a total of 13 queries. Zlib compression disabled.